Having missed the previous deadline cloud services vendor Synchronoss finally filed its restated accounts just before the new deadline passed. Synchronoss hasn’t filed any accounts since early 2017, when it realised there had been some inconsistencies in its accounts for the previous few years. It resolved to iron out those inconsistencies, then refile historical accounts once that process was complete. That web took a fair bit more untangling than it hoped and as a consequence it missed the Nasdaq-imposed deadline of 10 May 2018 to refile. Having done so, Synchronoss vowed to finally get the damn things done by the end of June and on the last working day of the month its accountants staggered over the finishing line. The company can be forgiven for using every last bit of time available because it could be sure that when those numbers were finally published a lot of highly-paid bean counters were going to pore over them obsessively. “We are very pleased to have filed our Form 10-K for 2017 and to have completed the restatement of our financial statements,” said Synchronoss CFO Lawrence Irving. “This was a comprehensive undertaking that involved a detailed and thorough examination of our current and historical financial statements, as well as our accounting policies and work processes. Our next step is to complete the process to resolve any outstanding issues with Nasdaq. There are obviously all the numbers and explanations you could wish for in the full filing, but here’s a summary of the adjustments made to each full year from 2013 to 2016. There were no adjustments to be made to 2017 because no accounts were filed. 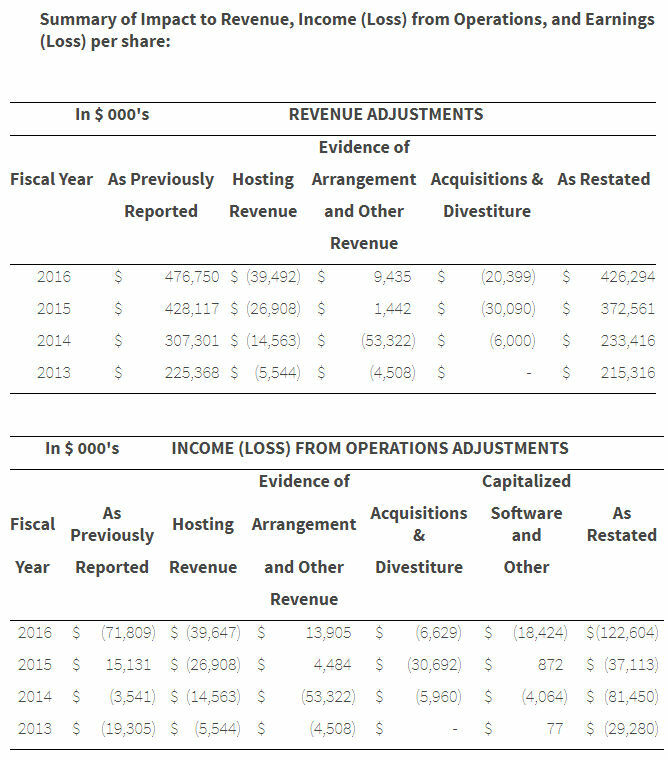 As you can see the adjustments were pretty significant, but perhaps not as bad as investors were fearing because Synchronoss stock was up 15% at time of writing.